Leap Year Weekend Essential Oil Giveaway! Let’s mark this Leap Year Weekend with a giveaway! Extra day, extra freebies! Winner #1 will receive one bottle each of Ginger, Oregano, and Thyme essential oils. 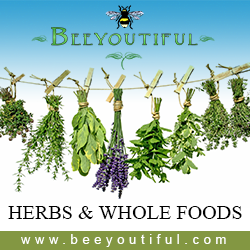 Winner #2 will receive one bottle each of Oregano and Thyme essential oils. Winner #3 will receive one bottle of Thyme essential oil. Tag a friend to let them know about the giveaway too! Winners will be contacted by email on March 1, 2016. Winners must provide a US address within 48 hours of contact or a secondary winner will be chosen. 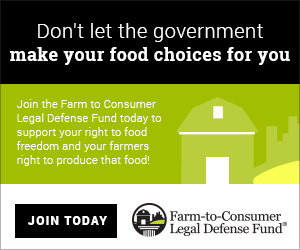 Enter below, head to the Giveaway tab on our Facebook page, or click here: http://www.rafflecopter.com/rafl/display/57e649184/? Without healthy bones and muscles, the body literally cannot function and move as it should. 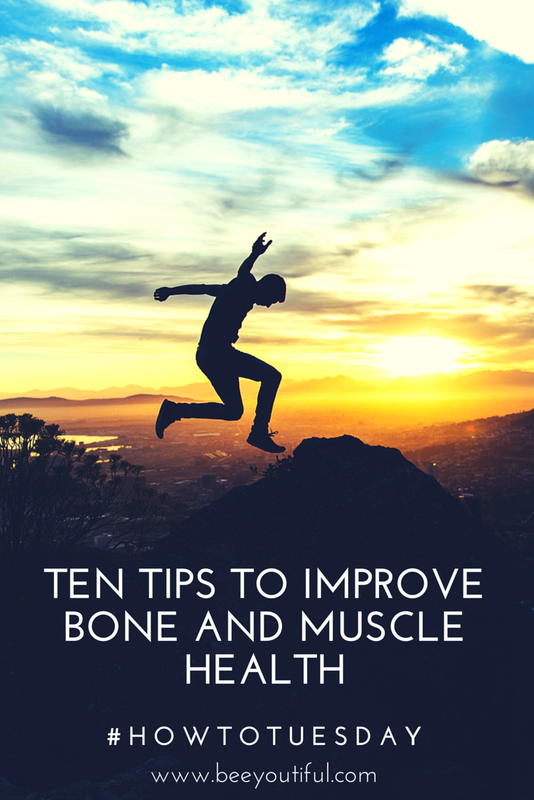 Keep your body strong with these ten strategies for supporting healthy bones and muscles! 1) Eat your greens! Green foods like broccoli, spinach, kale, and mustard greens are great sources of Calcium. 3) Weight bearing exercises. Lifting heavy things increases the strength of your muscles and can help to maintain balanced body weight. 4) Try dry brushing. Using dry brushing during your regular daily routine can help to encourage optimal circulation and muscle tone. It also helps to encourage the elimination of toxins in the body. 5) Drink adequate water for your body. Proper hydration helps to support good joint and muscle health by eliminating toxins that can lead to inflammation in the bones and muscles. 6) Drink some tea! Horsetail and Nettles are amazing for strong bones and good muscle health. 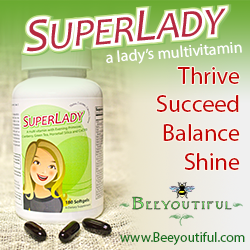 Both are abundant in bone and muscle-supporting minerals such as silicon, magnesium, calcium and selenium. Add in your favorite fresh fruit, use as a base for a smoothie, or add some rosehips or hibiscus to mix up the flavor. 7) Keep your supplements handy. Minerals, Omegas, and Fat Soluble Vitamins are must-haves for healthy bones. If you are not getting adequate amounts through your diet, be sure to keep some supplements available to fill in the gaps. 8) Consume Bone Broth and Gelatin. These are two easy and delicious ways to support your bones and muscles through nutrition. Packed with minerals and collagen, Bone Broth and Gelatin, especially used in conjunction with each other, can pack a powerful punch in the war on deteriorating bones and weak muscles. 9) Keep moving! Even when it is hard and challenging, don’t stop and don’t give up. Even if it is just range of motion movements or taking a slow stroll, keep moving and get in some physical activity every day. 10) Take care. Don’t forget your handy aids to support your Bone and Muscle health when you have pushed yourself a little too far. Tension Tamer, Glucosamine/MSM, Bromelain, Ow!-Ease, Hyland’s Arnica, Marjoram, Black Pepper, Basil, Spearmint, Pine and Cypress Essential Oils can all help when you’re feeling creaky. Catnip is forever infamous as a treat that rushes our feline friends into a euphoric state of bliss. But, did you know that Catnip is invaluable as an essential oil for the humans in your life too? Nepetalactone, the active ingredient responsible for the kitty frenzy, is also what makes Catnip exceptional at defending humans from the flying outdoor pests that are waiting to turn us all into an all-you-can-bite buffet. Studies show that a dilution of just 1% Catnip Essential Oil can deter those vile creatures. Catnip has many more great uses that go far beyond deterring mosquitos! 1) Helps calm and soothe. Catnip’s sedative nature encourages rest and peace. 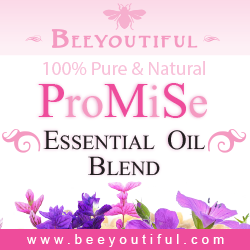 It is a great option to combine with other calming oils to help decrease restlessness and combat insomnia. 2) Soothes the tummy. Catnip can be very soothing to the tummy, particularly when experiencing flatulence. Combine 5 drops of Catnip Essential Oil with 1 teaspoon of Jojoba Oil and rub on the stomach and back. Catnip can also be partnered with essential oils such as Marjoram, Lavender, Spearmint, and Peppermint to bring additional support. 3) Regulate cycles. Does Aunt Flo have a hard time keeping appointments on schedule? Is her visit especially unpleasant? Catnip has been studied to show a positive impact on hormonal health, encouraging regular cycles and balance. 5) Say goodbye to dandruff. Adding a drop of Catnip Essential Oil to a daily shampoo has been shown to help decrease and even eliminate dandruff. Lather and rinse as normal. 6) Quiet the head. Catnip can be used either by itself or with other oils to help soothe a throbbing noggin. Combining with Peppermint, Marjoram, Ginger, or Lemon may help provide additional synergistic relief. 7) Expel excess water. Massaging the body with a mixture of one teaspoon Sweet Almond Oil and 5 drops Catnip Essential Oil can help encourage elimination of excess water that is being retained. 8) Quit the cramps. Catnip’s sedative effects help to decrease spasmodic events in the body by helping to relax and soothe tensed area. Diffusing Catnip intermittently during a coughing spell could help decrease the spasms during the cough. 9) Spark the brain. Catnip is an incredible support for the brain, helping function to remain optimal, especially in conditions like ADHD, Parkinson’s, and Alzheimer’s. Catnip Essential Oil offers all this and astonishingly, it’s still considered kid friendly! NOTE: Catnip is not considered appropriate for pregnant women, and nursing moms should check with a Certified Aromatherapist or their own healthcare practitioner to ensure it is appropriate for their situation. 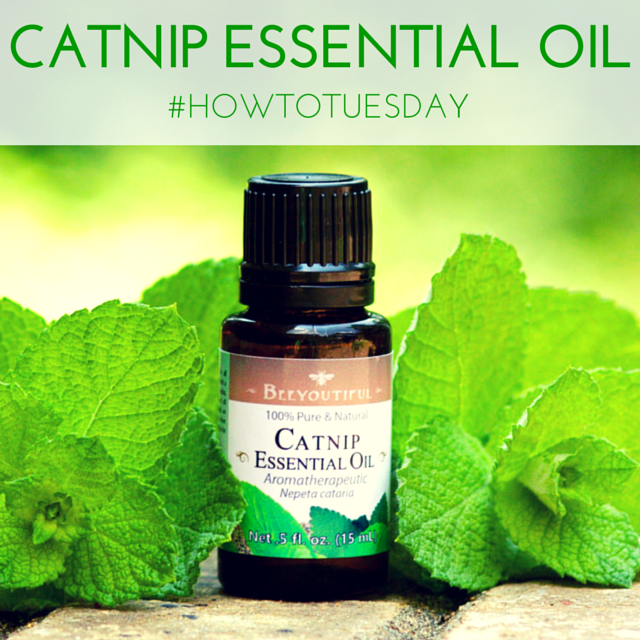 Can you add to our list of ways to benefit from Catnip Essential Oil? We’d love to know how it’s in use in your home! Eager for more recipes and tips on Essential Oil usage? 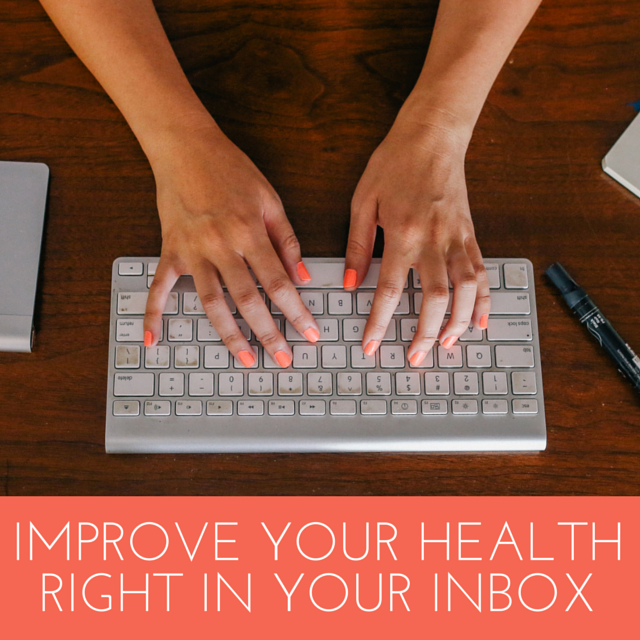 Our email series 101 Uses for Essential Oils is packed with information you can put to use right away! And don’t miss our list of 6 Crucial Things You Need to Know BEFORE Using Essential Oils. I grew up in the denim jumpers and homemade bread era of homeschooling, and wanted nothing more than to be like all the other cool kids who got to eat bologna sandwiches and wear jeans. As a second generation homeschooler, I came to the table with more than my fair share of things I was going to do differently in educating my children. I wasn’t going to be mean like my mother and have my children crochet daisies while eating bean soup and talking about Uzbekistan. No siree, my kids were going to get dressed every day and sit at reclaimed Anthropologie-esque desks while we did school properly with real home work and tests and grades. Find out today how our friend Esther Ramsey’s experience really turned out over at Hip Homeschool Moms. Then come back and read Esther’s other helpful post about building a toolbox to support her children’s brains! Does someone you love struggle with focus and attention? Which strategies have worked for you? Let us know in the comments below; we’d love to learn from you. When we first considered carrying Cedarwood Essential Oil at Beeyoutiful, cheers went up among the men, because its hale and hearty woodsy aroma is definitely favored by the masculine members of our team. But then the more we Beeyoutiful women learned about and used Cedarwood, we found its benefits and subtle aromatic nuances were delightful for both genders and all ages! It’s a team favorite now. Considered appropriate to use with children, Cedarwood Essential Oil is a fantastic support for the respiratory system and skin health, and aids in calming and quieting a restless soul. 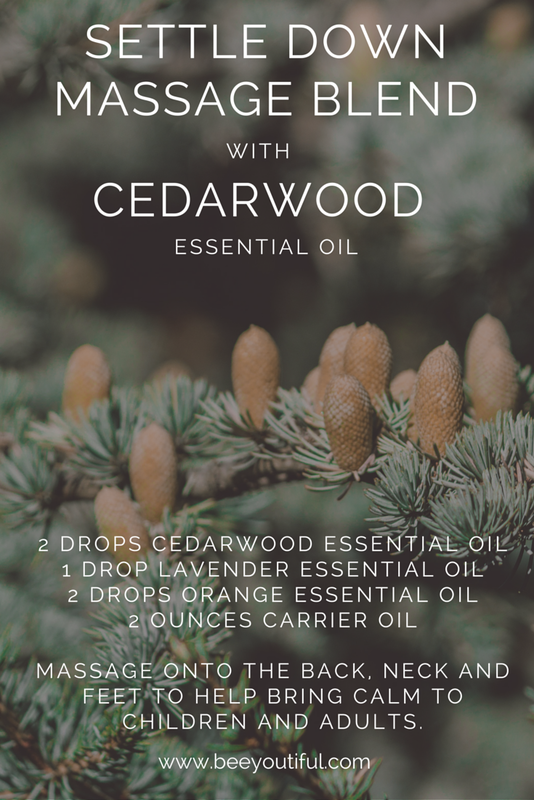 Here are just a few of the incredible ways we’ve already learned to use Cedarwood Essential Oil. 1. Add 7 drops of Cedarwood to 1 teaspoon of Sweet Almond or Jojoba Oil and massage on the chest, neck, back of the spine and heels of the feet to support the respiratory system. 2. To soothe an overstimulated child or adult, diffuse Cedarwood for 5 minute intervals until relaxed. May also mix with complimentary oils such as Bergamot, Cypress, Cinnamon, Frankincense, Lemon, Lime, Lavender, Rose, Neroli and Rosemary. 3. Add 1 drop of Cedarwood to your facial wash to help avoid acne or other facial blemishes. 4. Clean your floors with Cedarwood! Mix together and add to mop water. 5. Add 2-3 drops of Cedarwood to your shampoo to chase away dandruff. 6. Mix one drop of Cedarwood and one drop of Marjoram into Sweet Almond Oil, and use the mixture to massage stiff and sore joints. 7. Cedarwood helps to repel bugs and rodents; take advantage of this by dispensing a few drops onto a cotton ball and placing it in areas where pests are seen. 8. To support kidney health, add 3-4 drops of Cedarwood to Bath Salts. Mix thoroughly and then add to the bath water. Soak for 30-45 minutes. 9. Make your own “Cedar Balls” by putting several drops of Cedarwood Essential Oil on a piece of fabric. Put in a lingerie bag or organza bag and hang with clothing that needs protection from moths. 10. Cedarwood is calming and appropriate for kids! Massage on to the back, neck and feet to help bring calm to children and adults. These are just a few ways we have discovered that Cedarwood has rapidly become invaluable to us. We would love to know how you have used it; please share your ideas with us! Get your own bottle of Cedarwood Essential Oil here, or as part of our discounted Men’s Magic and Dream Team essential oil combination packs. Cedarwood’s also an ingredient in our kid-friendly blends, Easy Peasy Breathie, Immuni-T, and Bee Focused. Eager for more recipes and tips on Essential Oil usage? Our email series 101 Uses for Essential Oils is packed with information you can put to use right away! Bergamot is well known for its pairing with Black Tea, producing the much-loved flavor of Earl Grey. But did you know that Bergamot Essential Oil has some amazing benefits that go much further than just tea? Join us for How-To Tuesday and learn some of our favorite uses for this citrus oil. Using a non-reactive, non-plastic bowl, mix Bergamot, clay powder, and water together thoroughly. Once water has been thoroughly absorbed (a few lumps are okay; green clay is notoriously clumpy), apply to face. Let dry for 20 minutes, then wash and rinse. Optional: Add 1 drop of Spearmint Essential Oil for an even more refreshing tingle! Add one drop each of Bergamot, Cassia, and Clove essential oils to your diffuser’s reservoir, then fill up the rest of the way with Eucalyptus. Mix in a spray bottle and add water. Shake well before use. Spritz on surfaces, then scrub and clean all those dirty corners! Put all essential oils in a glass bowl or container and then add carrier oil. Use as a refreshing and cheerful massage oil. Store in a dark colored glass bottle. Refrigeration will extend shelf life. Bottle can be gently warmed after refrigeration by sitting in warm water for a few minutes before using in a massage. What’s your favorite use for this fragrant essential oil? 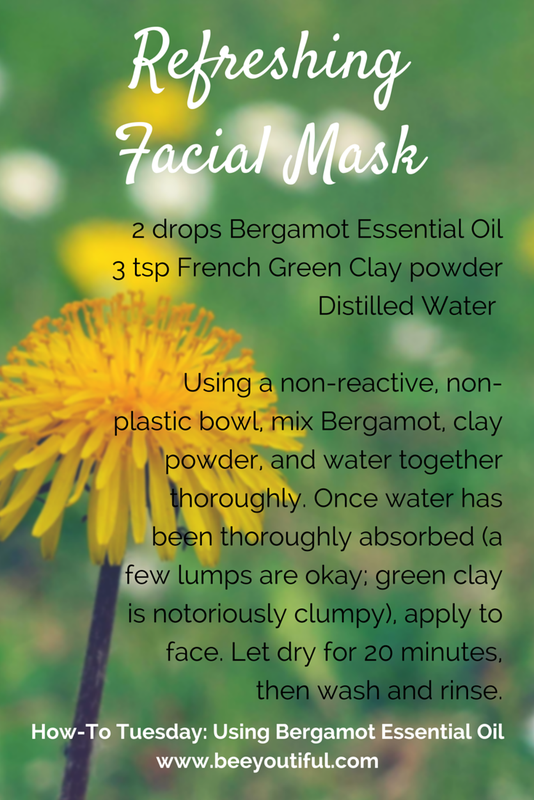 Tell us in the comments or on Facebook how you use Bergamot! 1) Black Pepper Essential Oil is kid-friendly and great to use in oil blends! When using topically, always dilute this oil with a ratio of 4 drops of Black Pepper to 1 teaspoon of a carrier oil. 2) Add a drop each of Frankincense and Black Pepper to 1 teaspoon of a carrier oil and massage in joints for support during sore or painful times. 3) Diffuse Black Pepper and Lemon Essential Oils to increase focus and attention. 4) Add 4 drops of Black Pepper to 1 teaspoon of Jojoba Oil and gently massage the abdomen and spine during digestive complaints. 5) For a quick immune booster, add 1 drop Black Pepper, 1 drop Tangerine, and 1 drop Frankincense to 1 teaspoon of carrier oil and apply to the chest and bottom of the feet. 6) Dilute 4 drops of Black Pepper in 1 teaspoon of Sweet Almond Oil. Massage the bottom of the feet to provide a warming affect. 7) After a hard workout or an injury, 4 drops of Black Pepper in a teaspoon of carrier oil makes a great massage oil. Apply to the area and then add warm, moist heat. 8) When you are feeling a bit under the weather, take a warming and soothing bath. Add ingredients to a glass bowl in order listed. Mix thoroughly to disperse oils throughout salt. Run a tub of hot water and add salt mixture, agitating well to dissolve.